The Wasp Empire is coming to the lowlands. They are conquerers who known no bounds. No one believes they are a threat even as the swarm the region, except one very smart Beetle-kinden and the people he has encircled himself with. Bug people. Sounds intriguing doesn't it? 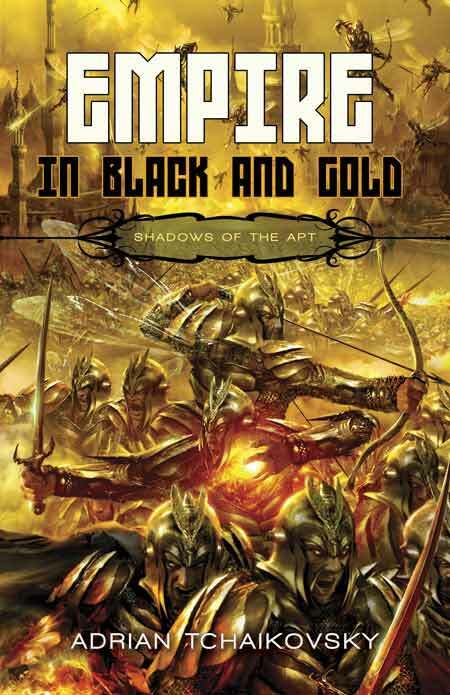 Bug people with steamtech in a Fantasy setting with large warring factions sounds even better, which is what you get in the shockingly original Empire in Black and Gold. Tchaikovsky is an author to watch and this Shadows of the Apt is a series to take note of. Empire and Black and Gold is as different a Fantasy world as you're likely to find. Picture a world where humans have broken into different tribes known as kinden with each developing vaguely insect features and traits known as ancestor art, but with some steam-tech thrown in that makes perfect sense with the overall history. Some of the main kinden include the mind linked Ants, the warrior Mantids, the flying and stinger handed Wasps, and the technologically minded Beetles. Finding out about each breed and what they can do is half the fun of the book as Tchaikovsky introduces more than a dozen types with more to come. But also there are half breed people who tend to end up with a mixed bag of attributes from both parents yet are generally looked down upon by society at large. One concept took a while to gel in my mind. Some insect-kinden are what is known as Apt, which means they have an aptitude for understanding and developing technological advancements such as clockwork or steam driven devices. Some kinden are non-Apt where they cannot even begin to fathom how to use most of this technology let alone create it. The non-Apt are also more in touch with magic although it plays only a small part in this story, but will be greatly expanded upon in future volumes. The Wasp Empire from the northwest is coming to the Lowlands. Most accept them and their money. A few are wary because of what they have seen and heard and only a small group is ready to slow them down because the Wasps can't be stopped by a few stalwart Beetle and Mantis people. They are a swarm that threatens to destroy or enslave everything in their path. Stenwold Maker is a Beetle-kinden trying to rally the lowlands into defense. Empire in Black and Gold surrounds his young protégés as they each play deep hands into the coming war. Some of the characters are a bit wishy washy with their inner thoughts and desires, but Tchaikovsky has set them up well to grow in succeeding volumes. Empire in Black and Gold is a rousing start to a series that is full of awesome ideas and premises in a tantalizing world of what is to come. I didn't see the end sequence coming, even after all the finale hints were laid out, but man can Tchaikovsky write big beautiful battles. 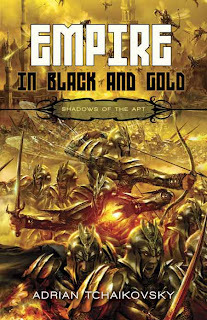 With Empire in Black and Gold debut author Tchaikovsky has created a completely original world never seen in the Fantasy genre prior as he eschews Elves and Goblins for races of people with attributes of insects. I give Empire in Black and Gold 8.5 out of 10 hats. Empire in Black and Gold is an awesome open salvo to a series I'll be devouring for years to come. This is a world filled with wonders, magic, and mechanics with characters that pull you through every step. The second volume Dragonfly Falling and third Blood of the Mantis are already available in the US with the fourth coming out this September, which caps the first major story arc of the series. So it will be a long haul series, but Tchaikovsky doesn't hold back much as he continues to reveal more about this world to keep you captivated. My one big question is where are my kinden action figures? This does sound like an interesting new take on fantasy. I have been watching for this book and really curious about trying it. Thank you for the review!